Uncharted 2 rests comfortably on its laurel-throne of interactive, high-action set pieces, and sips gleefully from its goblet of persistent, competitive online multiplayer. In the Uncharted 3 multiplayer beta, Naughty Dog poured out the goblet on the throne to douse players before release in an ambitious new kind of battle. No, Drake isn’t going Katamari. It’s Michael Bay meets Tomb Raider meets Gears of War - thrilling, challenging, and confusing. Levels like Chateau offer the same fare as Uncharted 2, which is good. Levels like Airstrip begin to peel back the layers of what’s really possible in online multiplayer, and then revert to static levels. 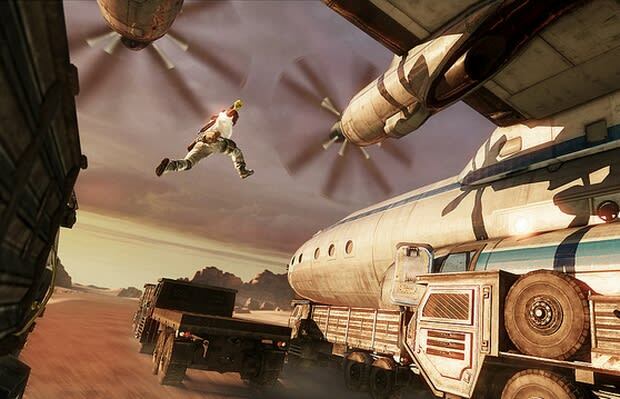 Fighting off waves of enemies on a moving cargo plane, about to take off, armed gunmen leaping from pursuing trucks to the loading door in heroic, inhuman leaps - the taut intensity thrives. It’s a great step, and perhaps the right one for consistency’s sake - fans can be, let’s say, averse to change.